If you've noticed your car acting up lately, or it's time for one of your regularly scheduled maintenance services, bring your car to Jenkins Auto Repair Professionals. Do you hear strange sounds like knocking or grinding? Have you begun to notice fluids leaking underneath your car? Is it time for your inspection or tune up? We've long been the choice for alternator replacement in Hancock County, so whatever you need, come see us today! A bad alternator could be the cause of your dead battery. If you're having to constantly jump you battery, or if you just replaced it with a new battery that still doesn't seem to hold a charge, that's a good chance that the real problem is with your alternator. When you're driving your car around the Indianapolis Indiana area, the alternator provides electricity to various components like your dashboard lights and air conditioner. Any extra power it creates gets stored in the car's battery for later use. If your alternator isn't charging you battery, then the next time you go to start your car, you have to deal with the frustration of a dead battery. This is often misdiagnosed as a bad battery, especially if it's an older battery, but you can save time and a further hassle by having your car serviced correctly by out trained mechanics. Bring your car or truck to our shop just East of Indianapolis in Greenfield Indiana for alternator replacement that you can trust. A starter is an electric motor that turns over or "cranks" the engine to start it. When you turn your key it allows electricity to flow from the battery to the starter motor and complete the circuit for the first revolution of your engine. There are two devices which allow the ignition to fire and start the engine, the Starter Motor and the Solenoid. Because automobile manufactures deemed it more efficient, the solenoid is most commonly attached to the starter. These two devices in conjunction provide a jolt of electricity from your battery to make the engine to “turn over”. If your car tries to start, but can’t quite get the job done, it could possibly be the starter seeing some trouble. There are generally only a few things that can lead to a starter motor misbehaving. Weak Battery: A Weak or undercharged battery cannot provide the starter with enough electricity to turn the engine over. Your car may make a rapid clicking noise, or just never quite get started. Bad Wiring: In order to take the charge from the battery, basic wiring is required. More than anything else, time and heat can take the worst toll on basic electrical components. A simple process of replacing some wiring can be all that’s required, or complete component replacement. 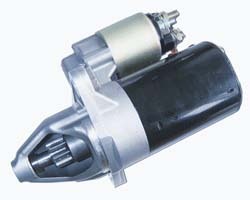 There are also a few mechanical issues that can arise with a starter motor that would cause it to fail. The Flywheel, for example is made up of multiple interlocking “teeth” which moves the crankshaft and pistons. Over time the flywheel can degrade and cause the starter to cease functioning. The process of troubleshooting a starter motor and solenoid combo can quickly become a tiresome task. Let Jenkins Auto Repair Professionals take away the stress of figuring out the problem and provide a quality service for your problem. Our technicians are expert with discovering the issue and finding the best long term solution. Plus, we provide Towing to the shop for service. So if you can’t get your vehicle fired up, give us a ring and we’ll get you back on the road.